Something no company website should be without is an online newsroom. Investing the time to craft an updated, properly laid out newsroom can greatly increase your media coverage and put you one step above your competition. The most important thing that goes into your newsroom is stellar content that focuses on your business and expertise, but that isn’t always enough to earn you the coverage you deserve. There are a few key rules we use for online newsrooms. They are simple, but can be easily overlooked and forgotten. 1. Have the link/button to your newsroom on your homepage: This is such an important step! 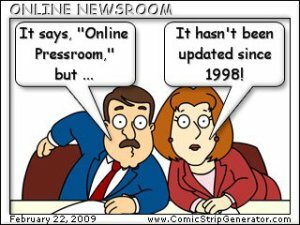 Even if you have the best designed and maintained press room that ever existed it won’t matter if no one can find it. With all the awesome content that you are going to be putting in your newsroom, you want to make sure it is “front and center,” so make it easy to find on your homepage. 3. Make sure the information is easily sharable: This goes along with number two, you want to make sure people can find the wanted information, and also share it. In today’s digital world where social media rules, (see our post about social media influence on the news), this is a step that cannot be overlooked. Social media coverage is a trend that is on the rise, and companies should not underestimate the affect it can have on their bottom line. Now that we’ve set up the three key steps to setting up a good online newsroom let’s talk about what should go into it. Like any other web site component, you will need some awesome content of course! But what content should it include? We recommend things such as: photos (hi-res, medium-res and low-res), audio and video clips (remember make the journalists job easier for them), press releases (latest and past), news/media coverage of your company (show off a little), Corporate Background info, Key personnel biographies and let’s not forget the really important stuff like a contact directory, RSS feeds and Opt-in options for email alerts. Now as if all that wasn’t enough to make your head spin, we’ve also created a list of “extras” that you can put in your newsroom to help make it stand out even more. Things like: a glossary if you are in a specialized industry and use a lot of terminology that a lay person might not understand, or a calendar of scheduled events so reporters can see what you have coming up, and possible future story ideas. Our team can help you create a standout newsroom with more extra options specific to your company. Our last recommendation is a search option, to make it as simple as possible to find relevant information on your website. If you need a newsroom overhaul or would like help in creating yours, we would love to help you shine. Contact us to see how we can help you create the online newsroom of your dreams.